Most folks will tell you that change is inevitable, an accepted fact of life. When it comes to change, the greatest example of this inevitability is the transition when one generation takes its place as the forebears of the future. 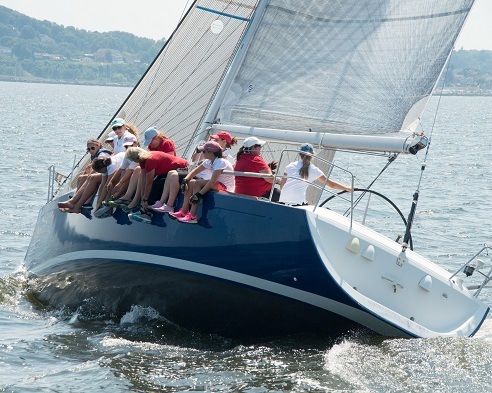 The theme for this year’s 11th annual AHYC Ms. Race, hosted by Atlantic Highlands Yacht Club in Atlantic Highlands, NJ on August 15, was “Racing for Change” and the generational shift in the event has begun. 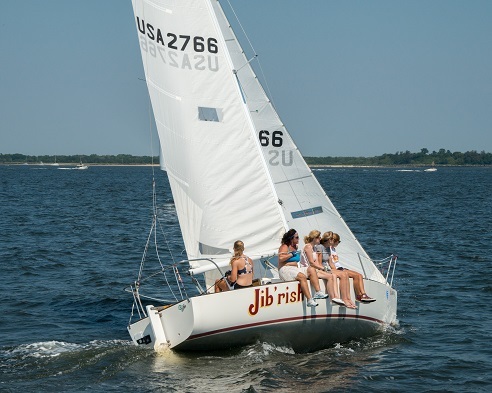 The Ms. Race is the only all womenʼs sailing event in Sandy Hook and Raritan Bay. This year’s fleet was a family affair including mothers, daughters, sisters and friends, and both first and second place were swept by junior sailors who have moved up to positions at the helm. Each year the Ms. Race places young women from the Atlantic Highlands Sailing Education Program (AHSEP) in the crews on each boat. For this year’s event two of the boats, Jib’rish, a J/24 driven by Brittney Slook age 17, and Overlap, a Beneteau 40.7 with Lauren Pepsney, 17, at the helm, took first and second place respectively. The day was picture perfect for sailboat racing, getting underway with a steady breeze of 11 mph, it building to just over 13 as the race went on. With relatively flat water the fleet made a quick lap around the Olympic Circle course in Sandy Hook Bay. Sunny skies and seasonable temperatures made an enjoyable afternoon for the women racing and the large fleet of spectator boats. For 2015, the Ms. Race and associated events have raised over $14,000 for 180 Turning Lives Around, a New Jersey-based charitable organization that assists victims of domestic and sexual abuse and violence. For information visit 180nj.org or ahyc.net.